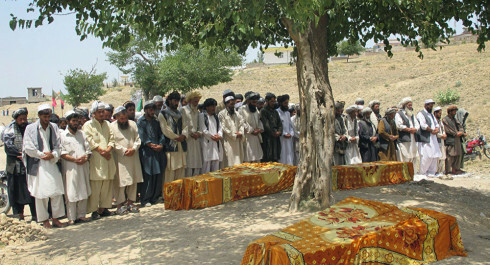 Civilians executed by paramilitary groups in Afghanistan 0 out of 5 based on 0 ratings. 0 user reviews. CIA-trained group involved in counterterrorism activities is also involved in the assassination of innocent civilians in Afghani Khost province. KPF (Khost Protection Forces) is a paramilitary group trained, equipped and directed by the Central Intelligence Agency (CIA) whose operations mainly take place in eastern Afghanistan. The organization is involved in torture and killing of civilians besides resorting to excessive force when allegedly carrying out counterterrorism operations. The group was created to contain and fight militants of Al Qaeda and the Talibans in Khost province. There are serious accusations to the group due to its arbitrary arrests and controversial night raids that only in the past month left 6 civilians dead. Testimonies of civilians and former commanders of KPF have disclosed the despicable procedures carried out by the group that has already faced lawsuits, like the one related to the assassination of a 14-year old teenager on a raid carried out by 14 members of the “counterterrorism” group. “The KPF, though, handed only three fighters over to the authorities. In an apparent effort to cover up their crime, the militiamen in court documents confessed they placed an AK-47 next to the boy’s corpse, at the order of their commander, to make it seem as if he was armed,” the report further read. Also, it has been reported that English was heard as the raids were taking place, so, some assume that American troops might have been involved in the incidents where excessive force was used. KPF is even more influential than the Afghan Army and police in the region with around 3500 militants recruited mainly from local tribes. The group is just one of the many paramilitary groups created by the CIA to “fight” terrorism in Afghanistan after 9/11.